The inspiration for this song is the injustice and heartbreak of the death of innocent Benji, caused by Breed Specific Legislation. I wanted to describe in music the moments that fall by the wayside as an innocent dog is 'written off' and condemned to die simply because of his/her shape or type - and in the case of abandoned 'ownerless' dogs, no matter how friendly or placid, calm or loving they are, the minute they are breed identified as a prohibited 'type', failed legislation is enforced which delivers the final 'let down' preventing dogs like Benji from being saved. 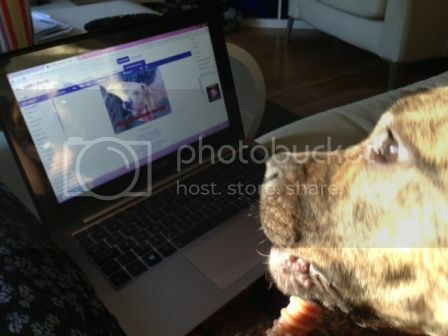 Benji's fate was sealed this way. I imagined him looking up at the sky wanting to be let out to play with a ball, giving licks to his jailer's hand, wanting a stroke on the head from the members of our society who would soon be killing him for looking a certain way. Benji had done nothing wrong. He never hurt a soul; he would have been a wonderful companion to the rescuer who offered to give him a forever home in the countryside and in glorious acres where he would have run free with his canine friends, enjoying a life of fun, hugs and love. 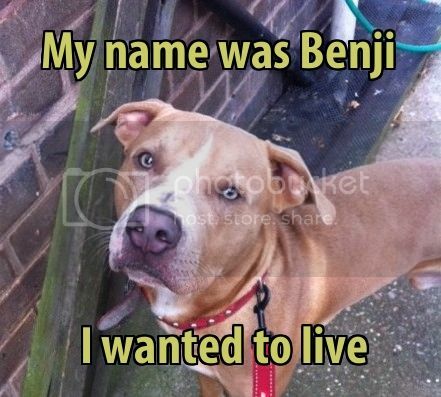 Benji deserved a future, yet after being let down and abandoned he was further let down by so called 'civilised' human beings when he was not allowed to live. 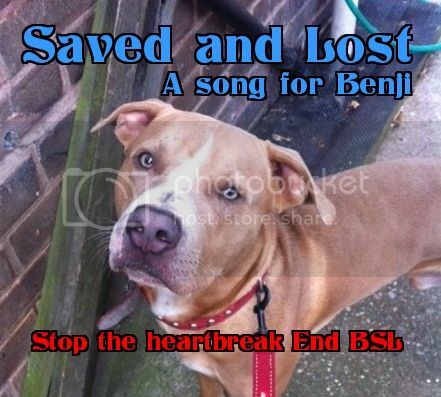 Benji was killed under BSL in early September 2013. His life was stolen from him when he was within arms reach of safety... he was one day away from being adopted out of the pound. This song is our way of saying Benji mattered, he deserved to live and regardless of what he looked like, he should have been allowed to reach the happy future that was promised to him by caring people. We imagine you running through fields of clover at the rainbow bridge, warm in the sunshine, young and healthy and with a smile on your face that only a dog can have when wagging a tail full of joy. We won't forget you Benji. Rest in peace now gentle soul, many tears have been shed for you. And I will send you the song as an mp3 by return email.